Box Compression Testing - Acme Corrugated Box Co., Inc.
Acme Corrugated is fully capable of performing box compression testing on site. This equipment allows us to test compression strength of a whole box, not just small pieces (as for ECT and FCT). Coupled with other tests, this provides further indication of expected box stacking performance and reliability. 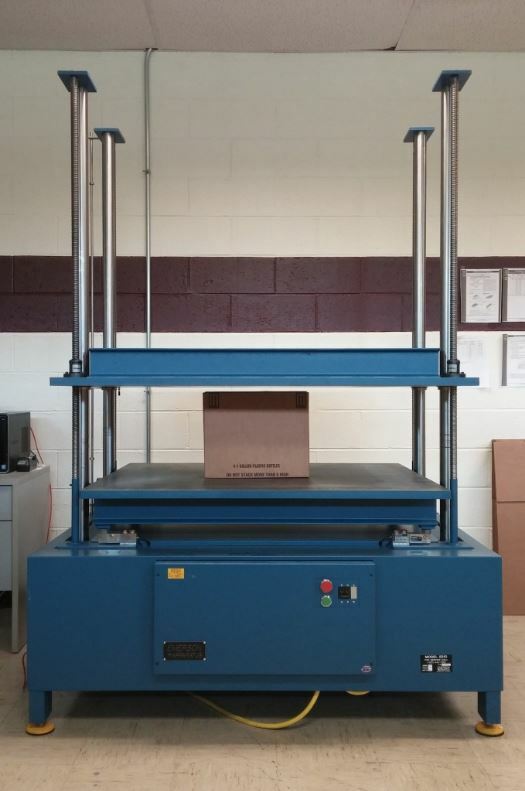 Featuring a 48” x 40” compression platen, we are able to test nearly all boxes manufactured at Acme. Boxes can be tested empty or as packed by the user. Peak at Fallback – most common general test, determining peak force and deflection when box fails. Profile simulates effects of repetitive stacking and unstacking of product on top of the sample box. Peak at Deflection – maximum acceptable deflection of box walls can be set and then peak load recorded when that point is reached. Load at Deflection – like “peak at deflection,” but load force recorded. Load is typically less than peak force.